Sweet white wine made from harvested grapes of which 60% have been affected by noble Botrytis.This fungus does not usually occur in the Mallorcan vineyards due to the climate, however, once every several years it does, and gives us a special wine such as this Martina. The wine is named after the producer’s first granddaughter and € 1 from each bottle sold is donated to the fight against Female Genital Mutilation. Miguel calls it his “most precious treasure”. Grape varieties: Riesling 50%, Chardonnay 45% and Moscatell 5%. Tasting Notes: Clean, amber-golden yellow hue, very dense in the glass with nice tears. On the nose, the wine is very aromatic with floral and fresh fruit aromas, particularly quince. It is fresh on the palate, yet full-bodied, long on the finish and well balanced. 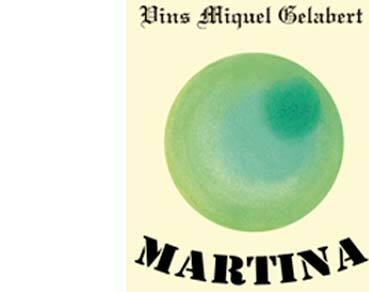 Food pairing: ideal on its own or with an appetizer of foie gras.